Material: Made of quality food garde silicone that is FDA approved, is safe, nontoxic and harmless to use. Design: The front part of the mitten is made of silicone and has groves for babies to chew on and soothe. The mitten has a velcro closure which is adjustable. You can adjust it to the comfortable size for your babies and no more dropping mitten. Fascinate: Attract your baby’s attention. Built-in plastic paper can make a rustle sound when babies wear it. 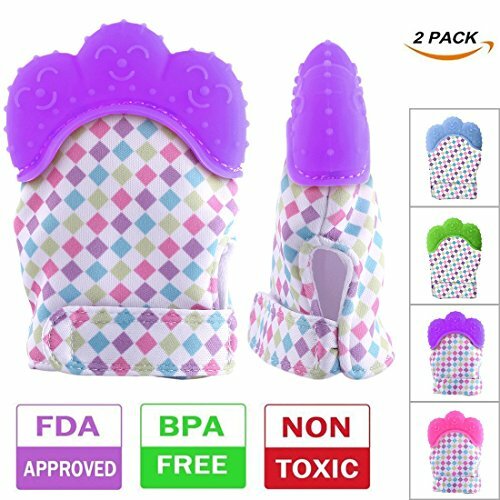 Ideal choice for babys gums massaging to relieve tooth pains, protect their hands from saliva and skin injury of chewing. Easy to clean: Can be put into washer or dryer, practical for daily use. Glove size: 2.95*4.13*0.79inch, give she a pair of magical teething mitten! Calm her baby down, then she’ll get more time to do her thing. The Teething Mitten will come with a clean protective bag to prevent the mitten from being stained.